The active segments of camelid antibodies are often called nanobodies because they can be much smaller than regular antibodies. A llama nanobody might bind only to a particular conformation—for example, "open" or "closed"—of a particular protein. Nanobodies also can bind to challenging proteins, such as receptors that work in oily cell membranes. Structural biologists like Kruse and Manglik want to find the exact nanobody that matches their protein of interest so they can lock the protein in one position and run tests to figure out its atomic structure. Learning the structure allows them to study how the protein works and provides a blueprint for designing drugs that target it. Nanobodies have opened long-locked doors in biomedical science. For example, they have allowed researchers to see for the first time how neurotransmitters such as adrenaline and opioids bind to receptors in the brain. Scientists just needed an easier way to find the keys. Right now, a scientist who wants to study a difficult membrane protein has to laboriously generate several milligrams of it, inoculate a llama with it—usually done through a third-party service—and hope the animal's immune system responds. Only then can she search for antibodies in a blood sample and hope there are enough to work with. By contrast, Kruse and Manglik's research team, led by first author Conor McMahon, a postdoctoral researcher in the Kruse lab, created a library of 500 million camelid antibodies using yeast cells. Each yeast cell has a slightly different nanobody tethered to its surface, made by a slightly different piece of synthetic DNA. The team developed a method where, instead of injecting a llama, scientists can now label their protein of interest with a fluorescent molecule and add it to the test tube. Yeast with surface nanobodies that recognize the protein will glow. 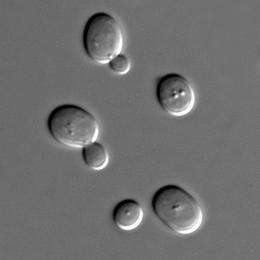 The researchers then use fluorescence-activated cell sorting, or FACS, to separate the glowing yeast from the rest. They sequence the DNA of those glowing yeast cells to learn what the nanobodies are. They can then use E. coli bacteria to grow as many of those nanobodies as they need. The whole process takes three to six weeks instead of three to six months. The team tested its yeast system on two proteins: the beta-2 adrenergic receptor, linked to asthma, and the adenosine receptor, which is a gateway for caffeine to deliver its buzz. In both cases, the nanobody bound to the desired receptor, bound only to that receptor, and bound to it only when it was "on." "We found that the yeast-derived nanobodies can do everything llama-derived antibodies can," said Kruse. The team is now offering vials of the yeast mix and usage instructions free of charge to any nonprofit labs that want them. Commercial companies can license the yeast. "We made a big batch," said McMahon, so there's plenty to go around. More than 40 labs requested vials before the paper was even published. "Nanobodies are making it possible to develop drugs for biological targets that antibodies were simply too big to hit," said Manglik. "By making nanobody discovery quick and easy, we hope our platform will dramatically accelerate the potential applications of this exciting technology." "I think we'll see things that blow the animal immune system away," added McMahon. "This is new technology. It's only going to get better. Hopefully it will work as well or better so we won't need llamas anymore."